his is the harrowing moment a young Palestinian man was allegedly shot by an Israeli sniper in front of a camera crew helping him search for his family before being fatally shot again as he struggled to get up. 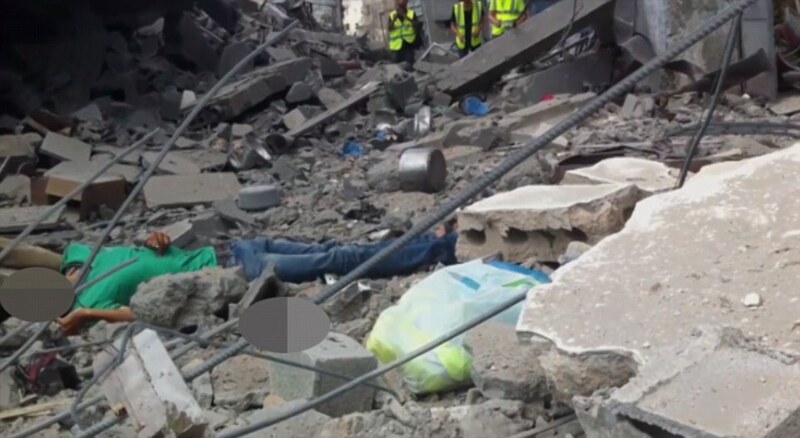 The footage, which MailOnline can not independently verify, was captured by an activist from the pro-Palestinian International Solidarity Movement in the Shijaiyah neighbourhood of Gaza City. 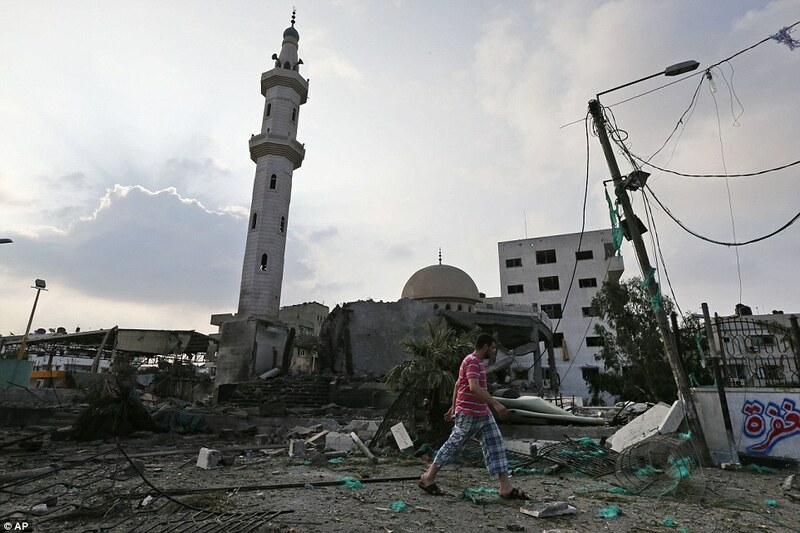 Muhammad Abdellah claimed he and other ISM volunteers made their way into Shijaiyah on Sunday after the area came under prolonged and heavy bombardment from Israel, which claims the neighbourhood is a major source for Hamas rocket fire against its civilians. 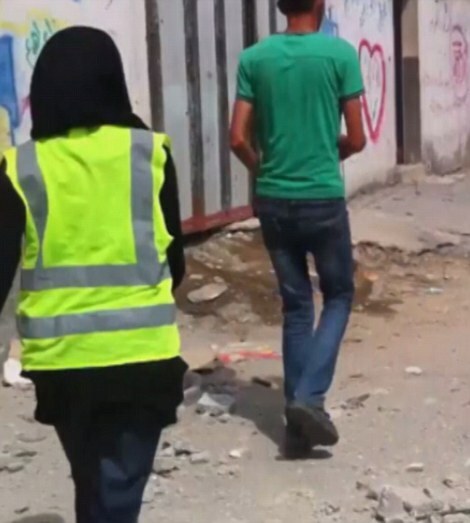 He said that the ISM team came across a young Palestinian man, who told them he was looking for his family, and that they followed him in an attempt to help him find his relatives. As the group tried to make their way across a heavily damaged area, shots suddenly rang out. The first sent the group scrambling for cover, but did not hit anyone, but the second hits the man in the green t-shirt. Abdellah explained that he and the other ISM volunteers were unable to approach the young man, amid fears they would be targeted too. 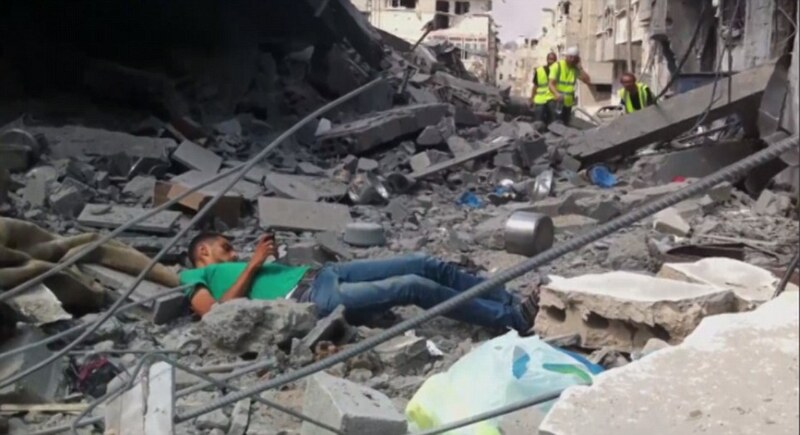 Then, the Palestinian was hit a second time as he lay on the ground. ‘And that bullet, I guess it was in his heart or like or almost there, because he was like going and dying in front of our eyes,’ the activist said. MailOnline has not been able to independently verify the exact circumstances of the shooting, or whether it was fatal. The name or age of the man, who the ISM said died from his wounds, could not be confirmed either. The Associated Press have asked the Israeli Defence Force for comment, but has had no response yet. In Cairo, U.N. chief Ban Ki-moon and U.S. Secretary of State John Kerry met Egyptian officials today in the highest-level push yet to end the deadly conflict. Ban then traveled to Israel. 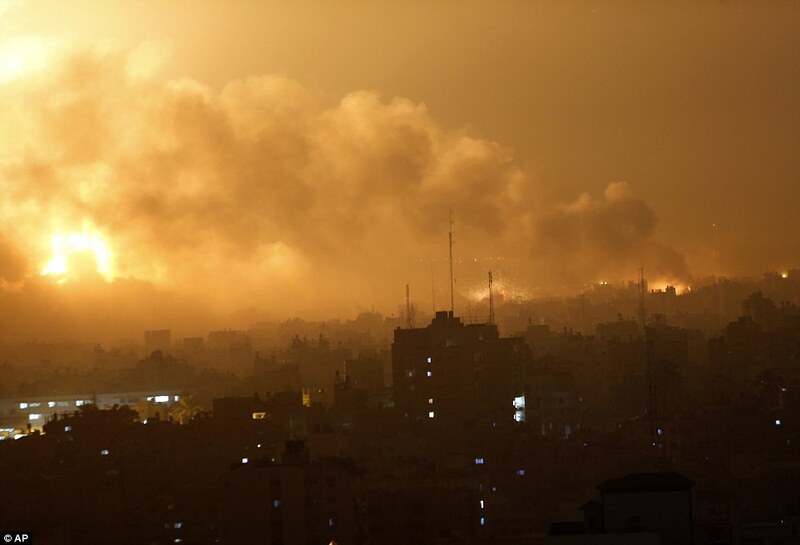 Israeli Prime Minister Benjamin Netanyahu, meanwhile, urged the international community to hold Hamas accountable for the latest round of violence, saying its refusal to agree to a cease-fire had prevented an earlier end to the fighting. ‘What we’re seeing here with Hamas is another instance of Islamist extremism, violent extremism that has no resolvable grievance,’ Netanyahu said at a joint press conference with Ban in Tel Aviv. He compared Hamas with al-Qaida and extremist Islamic militant groups in Iraq, Syria and Africa. ‘Hamas is like ISIS, Hamas is like al Qaida, Hamas is like Hezbollah, Hamas is like Boko Haram,’ he said. Netanyahu was responding to a call by Ban that the sides address the root causes of the fighting and work toward bringing about a two-state solution. 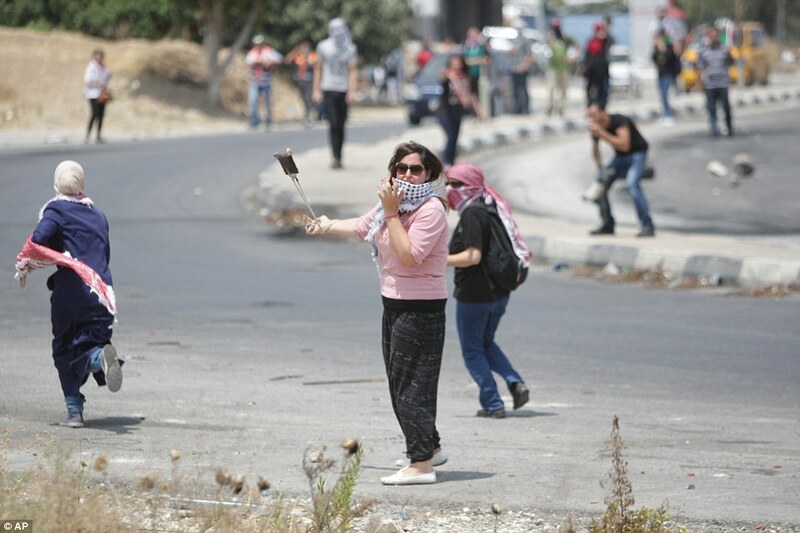 ‘My message to Israelis and Palestinians is the same: stop fighting, start talking and take on the root causes of the conflict so we are not back to the same situation in another six months or a year,’ Ban said. Netanyahu responded that Hamas, a group whose charter calls for the destruction of Israel, does not want a two-state solution. 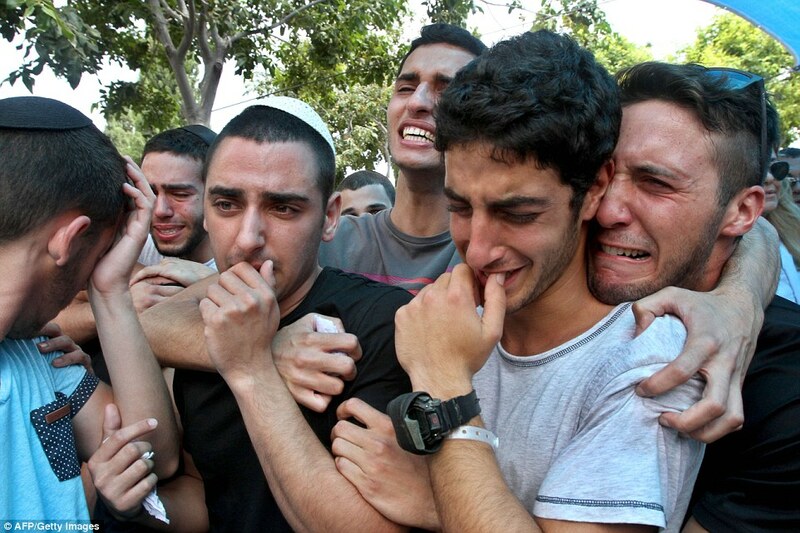 Meanwhile an Israeli soldier is missing following a deadly battle in the Gaza Strip, a defense official said today as Israeli airstrikes pummeled a wide range of targets in the coastal strip and diplomatic efforts intensified to end more than two weeks of fighting that has killed at least 585 Palestinians and 29 Israelis. The defense official told The Associated Press the soldier went missing after a deadly battle in Gaza over the weekend and it was not immediately clear if he was dead or alive. The official spoke on condition of anonymity because he was not authorized to discuss the incident with media. The development adds a further complication to international efforts to broker a truce. U.N. chief Ban Ki-moon and U.S. Secretary of State John Kerry met in Cairo late Monday to launch the highest-level push yet to end the deadly conflict. The U.N. has said that the majority of the Palestinians killed were civilians, among them dozens of children. 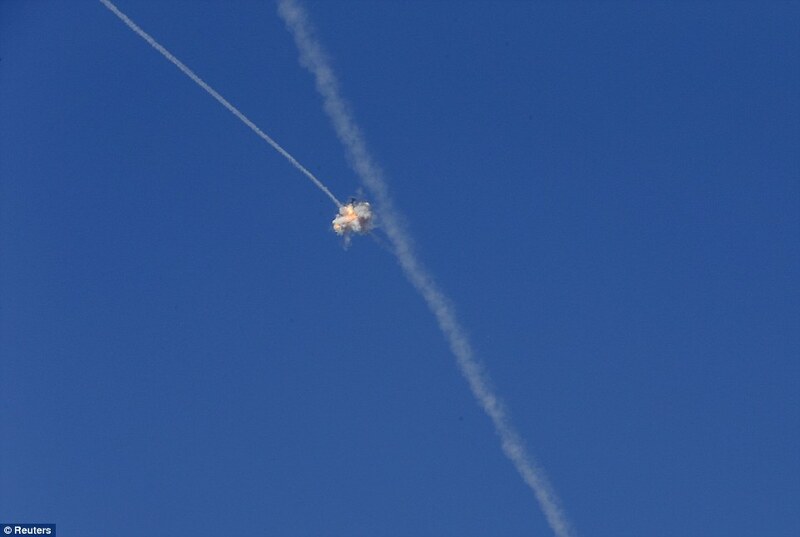 Israel has said its campaign, launched July 8, is aimed at stopping Hamas rocket fire into Israel – some 2,000 rockets have been launched over the past two weeks, the military says – and destroying tunnels the military says Hamas has constructed from Gaza into Israel for attacks against Israelis. 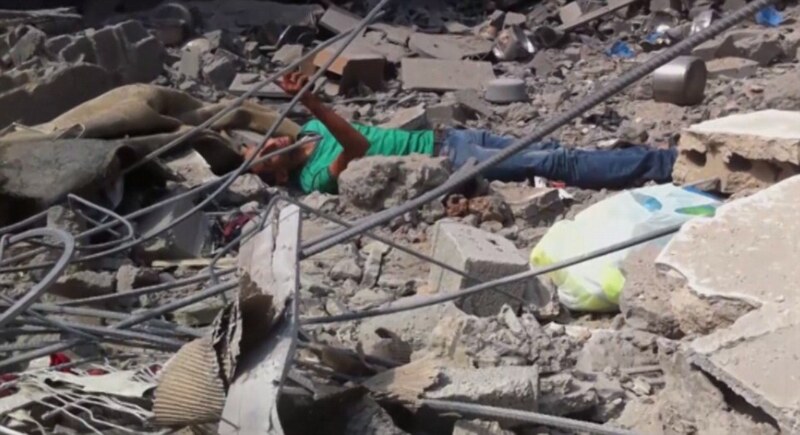 On Monday, 25 members of the same family were killed when Israeli forces struck a house near Khan Younis, the Israeli human rights organisation B’Tselem said. The dead included 18 children and five women, three of whom were pregnant. 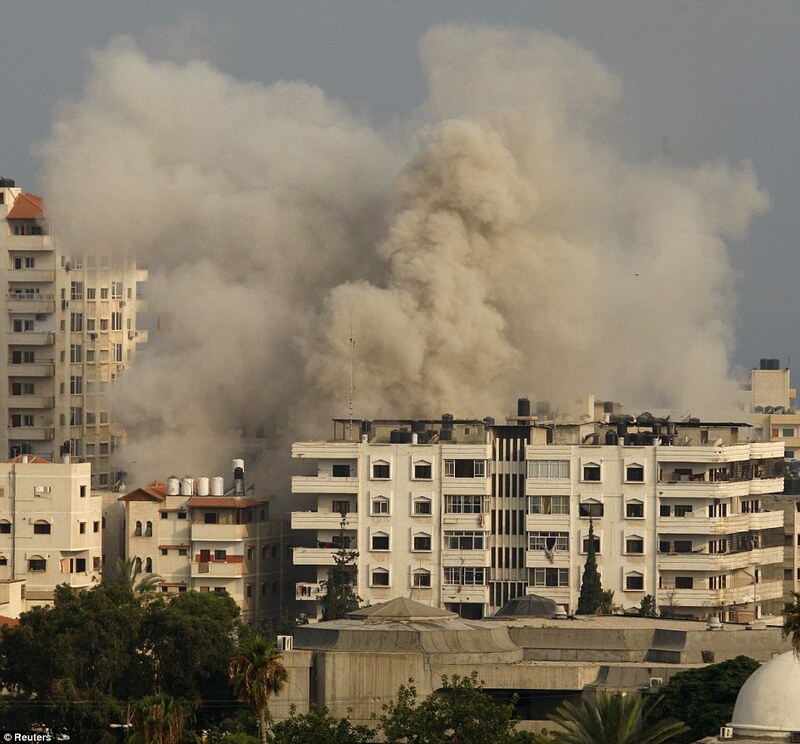 Overnight, Israel bombed five mosques, a sports complex and the home of the late Hamas military chief, a Gaza police official said. 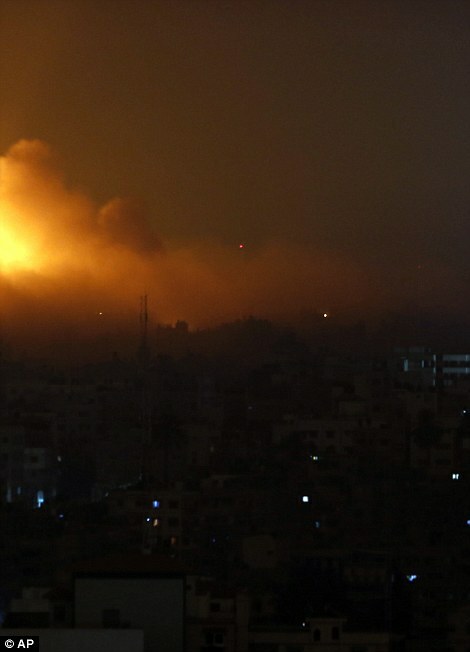 The airstrikes set off huge explosions that turned the night sky over Gaza City orange early Tuesday. The sound of the blasts mixed with the thud of shelling, often just seconds apart, and the pre-dawn call to prayer from mosque loudspeakers. 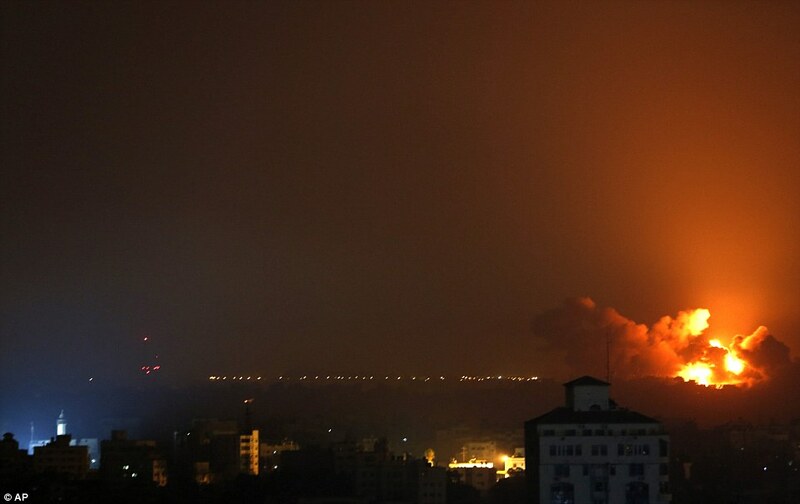 Israeli aircraft hit more than 150 targets, including the home of the late leader of Hamas’ military wing, five mosques and a sports complex, said Gaza police spokesman Ayman Batniji. There were no casualties in the mosques or at the sports complex, which includes a gym, three martial arts studios and a soccer field. 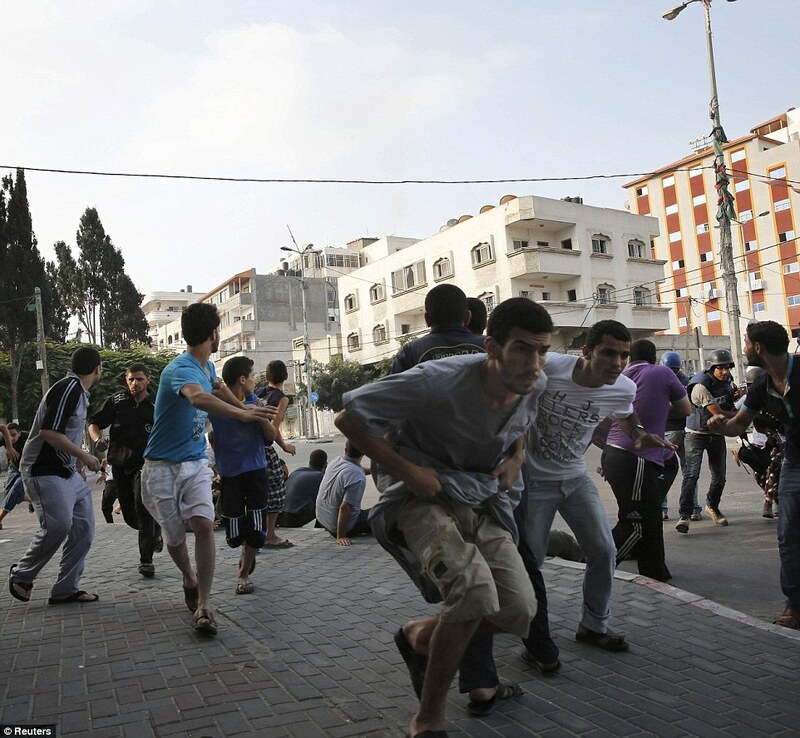 Dozens of journalists and residents of a central Gaza City high-rise evacuated from the building after an Al-Jazeera correspondent said it was hit by Israeli gunfire Tuesday. 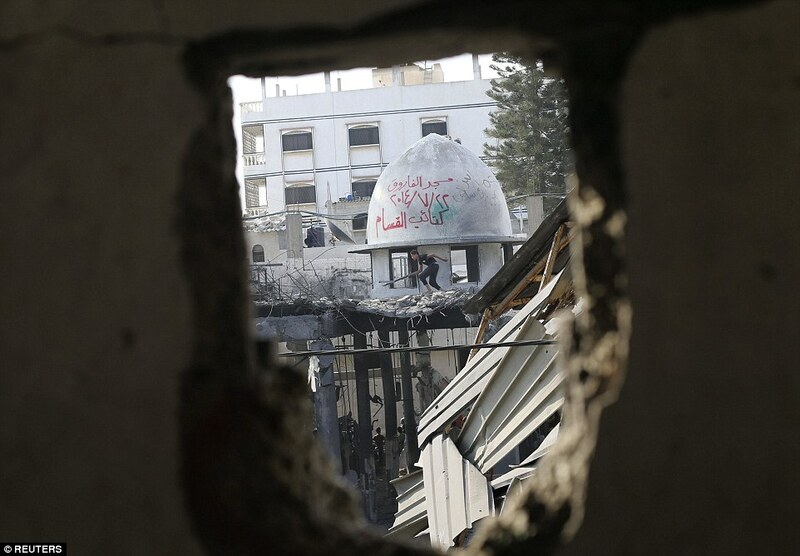 The correspondent, Tamer al-Misshal, said two bullets hit the building, one puncturing a window. 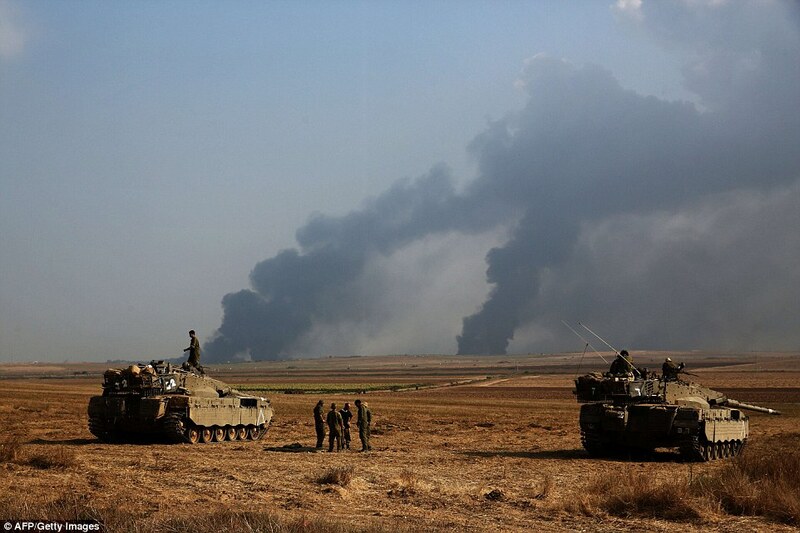 Tank shells also damaged several houses along the eastern border of the territory, Batniji said. 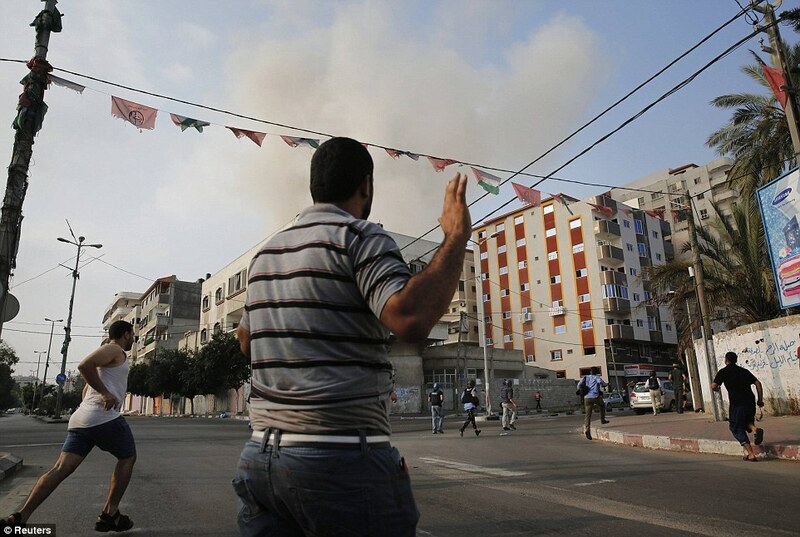 At least 19 fishing boats were burned by Israeli navy shells fired from the Mediterranean Sea, he added. 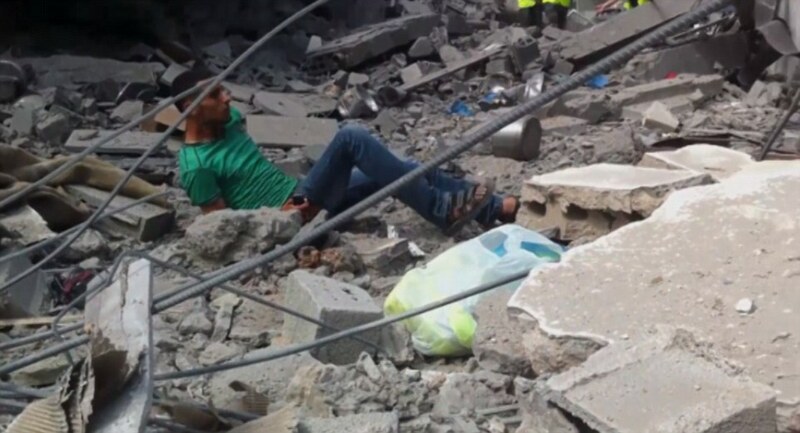 Six upper floors of a Gaza high-rise collapsed onto the two lower stories, buckling them into rubble. At the scene, construction company owner Ehab Batch, 40, and several of his workers were trying to retrieve documents from what had once been the company’s 2nd floor offices. Batch, who said he had had no work in the past year because Egypt had blocked border tunnels that bring in construction material, said Gaza needs an immediate cease-fire and a deal that would open all border crossing points. 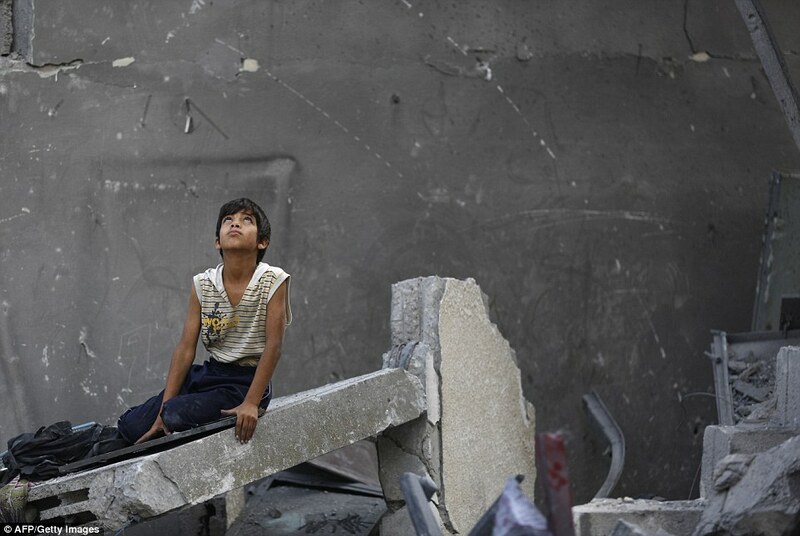 ‘We need Gaza people to have a (normal) life, as all the people in the world,’ Batch said. 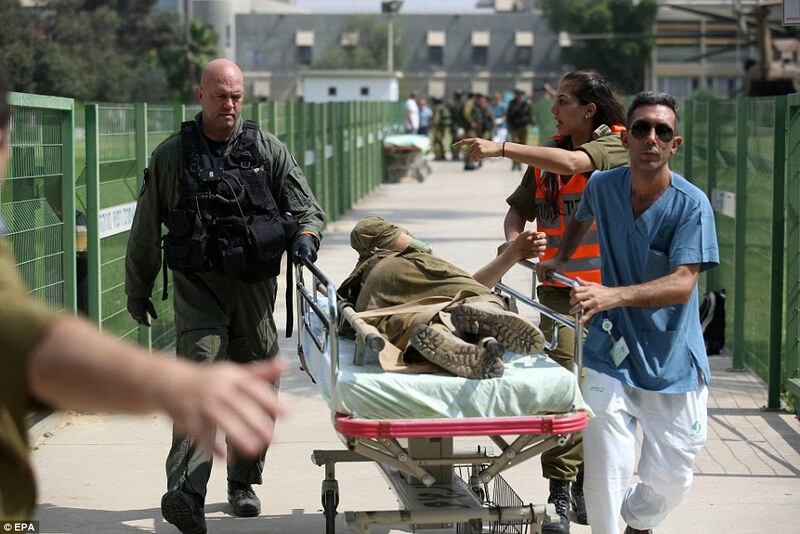 Reports of a missing soldier invoked Hamas’ claims earlier this week that it had captured an Israeli soldier. Israel’s U.N. ambassador initially denied the claim but the military neither confirmed nor denied it. For Israelis, a captured soldier would be a nightmare scenario and Israel has paid a heavy price to retrieve soldiers – dead or alive – captured by its enemies. 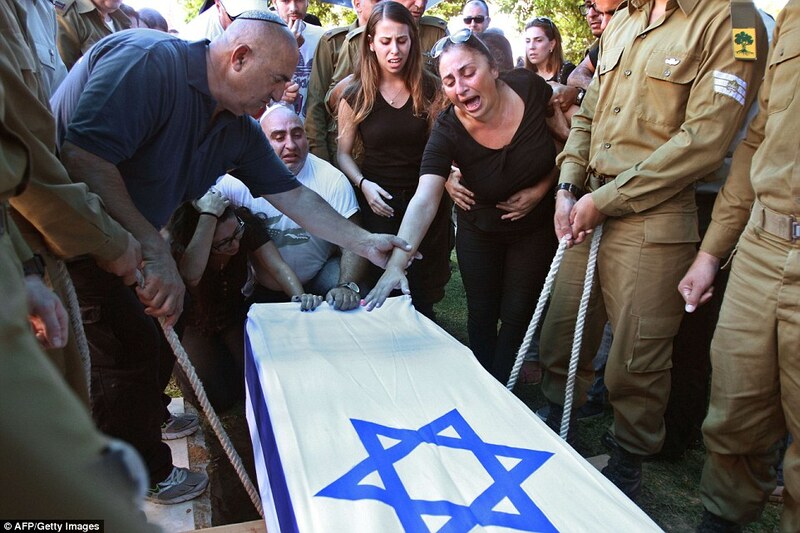 Israel feels a strong need not to leave any of its soldiers behind, including the remains of dead ones, and has engaged in lopsided prisoner swaps with its foes to bring home captured soldiers. 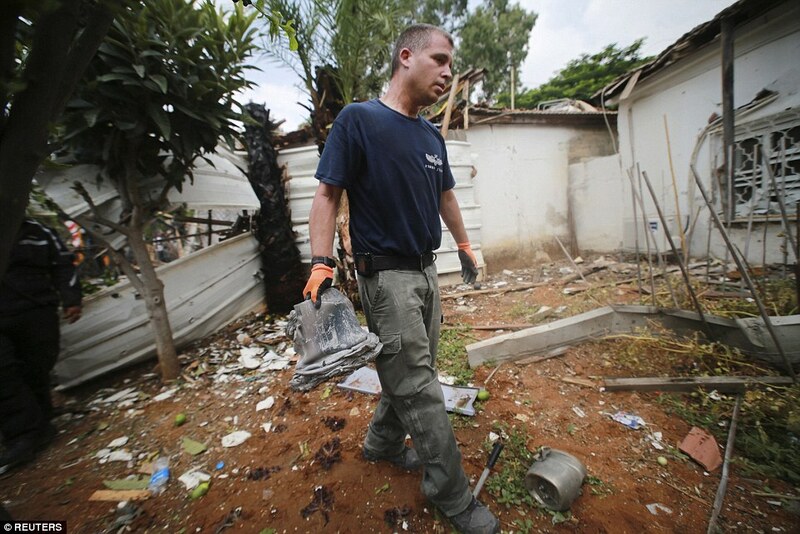 In 2008, Israel released five Lebanese militants in exchange for the remains of two soldiers killed in the 2006 Lebanon war. Also in 2006, Hamas-allied militants seized an Israeli soldier in a cross-border raid and held him captive in Gaza until Israel traded more than 1,000 Palestinian prisoners, some of whom were involved in grisly killings, for his return in 2011. 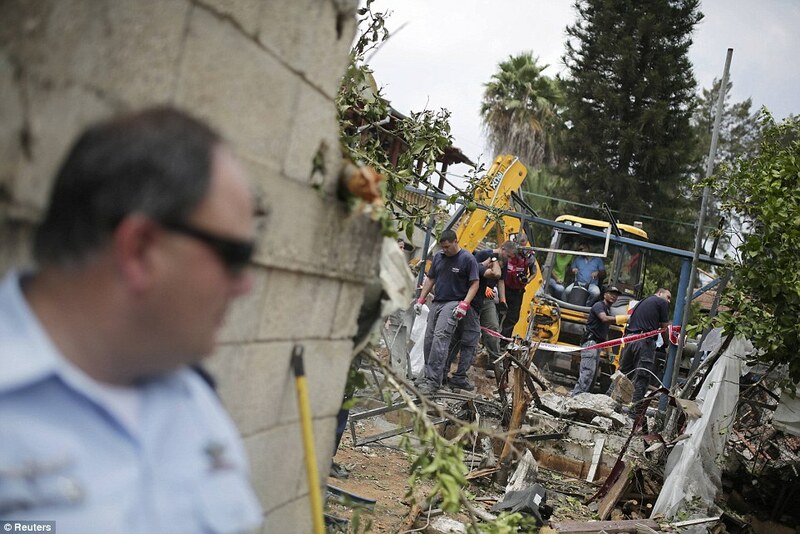 Hamas had threatened in the past to kidnap more Israelis and Israel says the militant group’s attacks through tunnels that stretch into Israel are for this purpose. Egypt, Israel and the U.S. back an unconditional cease-fire, to be followed by talks on a possible new border arrangement for Gaza. 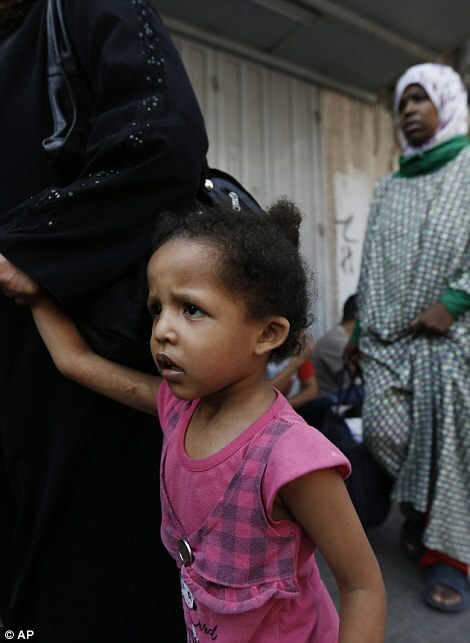 Israel and Egypt have severely restricted movement in and out of Gaza since Hamas seized the territory in 2007. 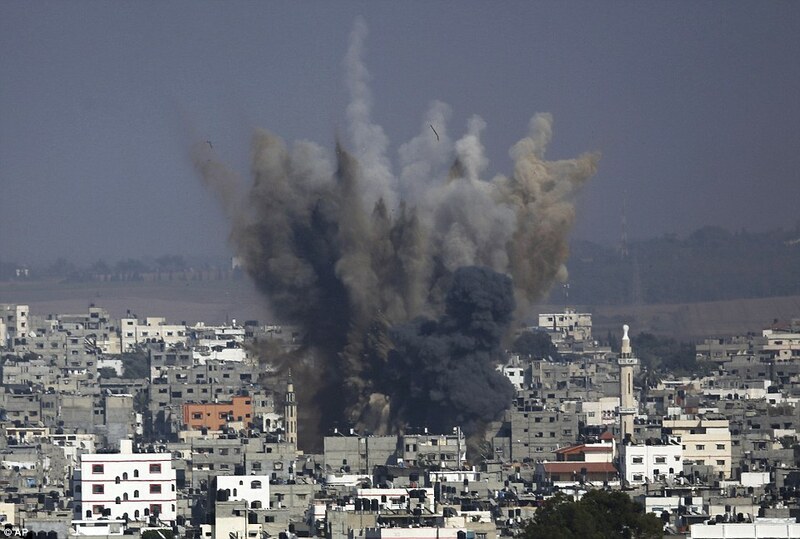 Hamas, with some support from Qatar and Turkey, wants guarantees on lifting the blockade before halting fire. 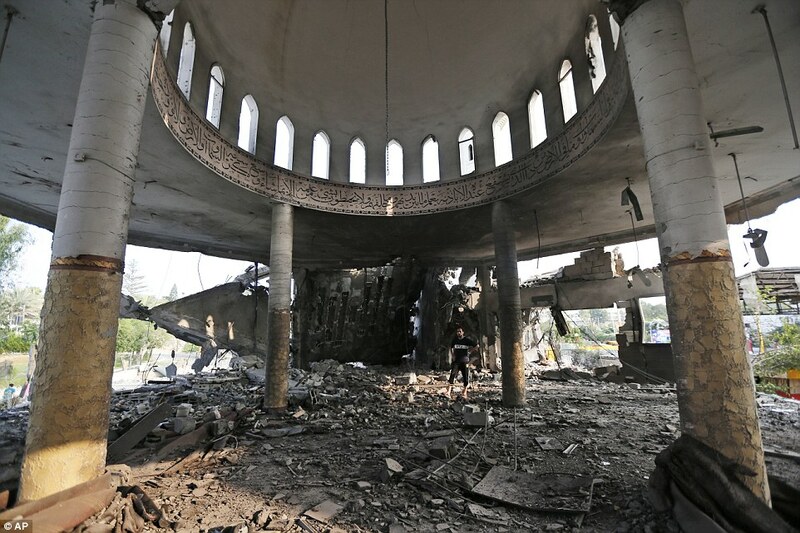 The Islamic militant group has no faith in mediation by Egypt’s rulers, who deposed a Hamas-friendly government in Cairo a year ago and tightened restrictions on Gaza – to the point of driving Hamas into its worst financial crisis since its founding in 1987. The top Hamas leader in Gaza, Ismail Haniyeh, said Monday that Gaza’s 1.7 million people share Hamas’ goal of forcing Israel and Egypt to lift the blockade. After a meeting with Egyptian Foreign Minister Sameh Shukri, Ban said that ‘violence must stop by all sides,’ and that they must enter negotiations, apparently siding with Cairo’s approach. ‘We can’t claim victory simply by returning matters to where they stood before they led to terrible bloodshed,’ Ban said. 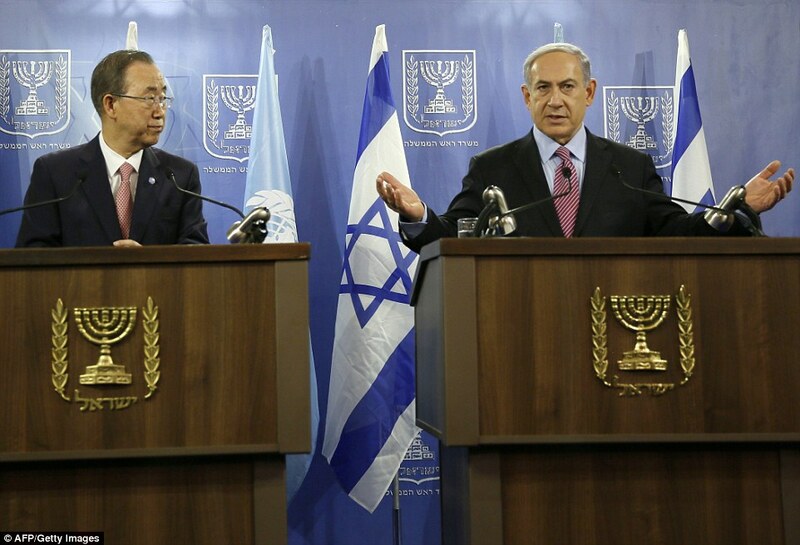 After Cairo, Ban was set to meet with Israeli and Palestinian officials Tuesday. 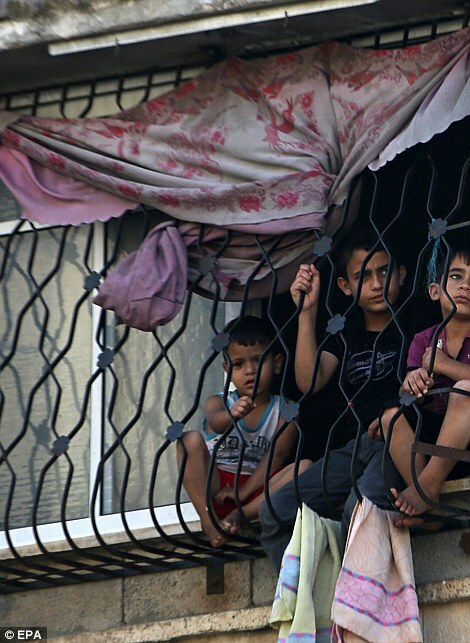 The border blockade has set Gaza back years, wiping out tens of thousands of jobs through bans on most exports and on imports of vital construction materials Israel says could be diverted by Hamas for military use. Israel allows many consumer goods into Gaza, but experts say Gaza’s economy cannot recover without a resumption of exports. The Rafah passenger crossing with Egypt is Gaza’s only gate to the world, but Egypt has tightened restrictions over the past year, allowing only medical patients, Muslim pilgrims and Gazans with foreign passports to travel. It’s not clear exactly what Israel and Hamas would each demand in return for agreeing to a truce now, but senior State Department officials said the issue of opening border crossings – potentially into Israel and Egypt – was under discussion. 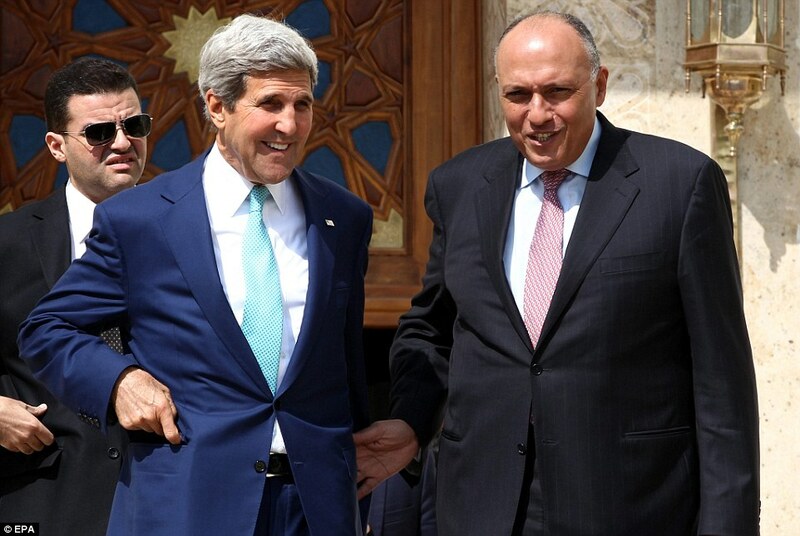 Kerry remained in Cairo on Monday for more meetings with top Egyptian officials. But there were no immediate plans for face-to-face meetings with officials from Qatar, Turkey, Israel and the West Bank.